I thought this was a dupe for Benefit Gimme Brow, and while the formula is quite similar/same shade.. the details are in the brush! The gimme brow is a little smaller, making it easier to use. This one is a little larger and makes a little more of a mess. For the price difference, I can deal with it. I liked it and I will have to repurchase once I get through some other brow products. I used this more as a colour corrector, but it wasn't very good. I used to really like this before I became more of a makeup enthusiast. I don't touch it anymore, its greasy, and messy. This isn't finished but I'm over it and it's old now. I love this liner, and I have 2 back up's still. My only complaint is that they seem to dry up really quickly now. 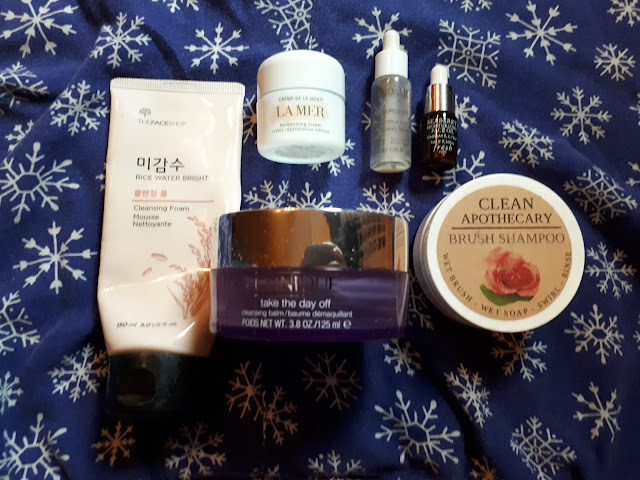 I may be open to trying some new brands when I get through the others, does anyone have any good suggestions? I prefer the brush tip vs felt tip. But I'm open to trying new ones! This was a nice mascara! The wand was more in a C shape, so it made it easier to get some volume in the lashes. It wasn't too wet of a formula either which I like. 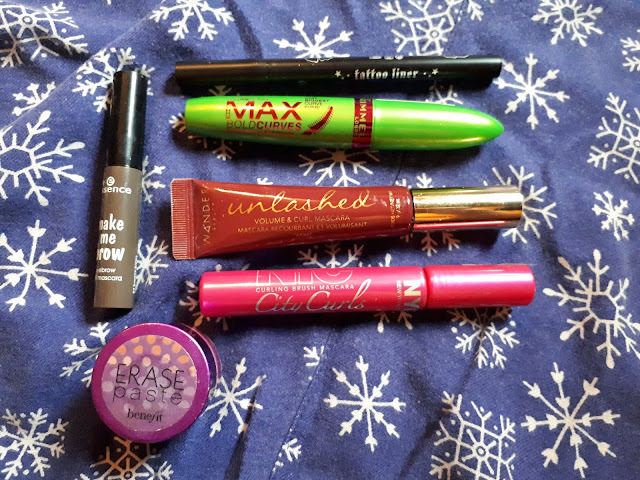 I really enjoyed this mascara! I have a ton more to get through before I even consider purchasing more. These were both unfortunately tosses. I've had them too long and they dried up before I could even use them. This was a gentle cleansing foam, but I preferred to use it in the summer. It does dry my skin out a little in winter. TheFaceShop always has great products for affordable prices. I wouldn't repurchase this based on my dry skin, but I'm sure oily skinned people would enjoy this for sure. I bit the bullet and finally tried this. Way too expensive for the amount of product you get, and honestly, it reminds me of a slightly creamer Nivea Creme. The same scent also.. just the nivea breaks down a little more watery on the skin, and the La Mer stays thick and creamy. I liked it, but I would never be able to justify spending that much again on such a meh cream. This didn't do much for my skin at all, and the sample seemed to last quite a while. I wouldn't repurchase this though because I didn't notice a difference in my skin. I love this face oil! It's lightweight but provides hydration/moisture. I love it mixed into face moisturizers when I feel like I need that extra boost. I love this stuff. It's been in my empties before and I've already repurchased a back up! I received this in two of the Beautylish Lucky Bags that I had purchased in previous years. I liked that it was a soap block but that's about as far as my liking this product goes. The rose scent is very strong, and the soap feels as if it never really washes out of your brushes. It ruined a brush of mine and the soap just lingers. Not a fan, and now I'm not sure what I will do with the other one. This is such a perfect scent for fall/winter. It has that comforting cinnamon scent, but also slightly of apples. 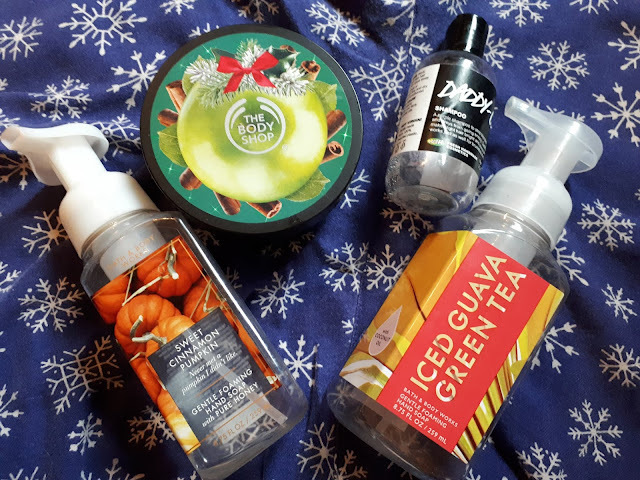 The Body Shop body butter is always a beautiful formula, and this was perfect for this time of year. I was on the hunt to find the perfect purple shampoo for my blonde hair, and while I liked this, it's not my favourite. I did find it a little more drying than other purple shampoo's and didn't quite tone my hair as much as I would have liked. So I wouldn't repurchase it. As you know, I love this foaming hand soap. I always pick them up when they are on sale. I'm not sure I would repurchase the Iced Guava scent again, but I really enjoyed the sweet cinnamon pumpkin for fall. I already have backups! I really enjoyed both of these scents, and they were a part of a limited collection released last year. St. Nickerdoole was like a sugar cookie, but with cinnamon and slight apple scented. Cranberry & Tinsel was the perfect match of Cranberry and pine. I'm not a fan of pine scents at all but this is just so perfect for this time of year. It smells just perfect with the lights off, and the Christmas tree on. All of these smelled great. I think the Pumpkin Donut Shop was my favourite from the three. 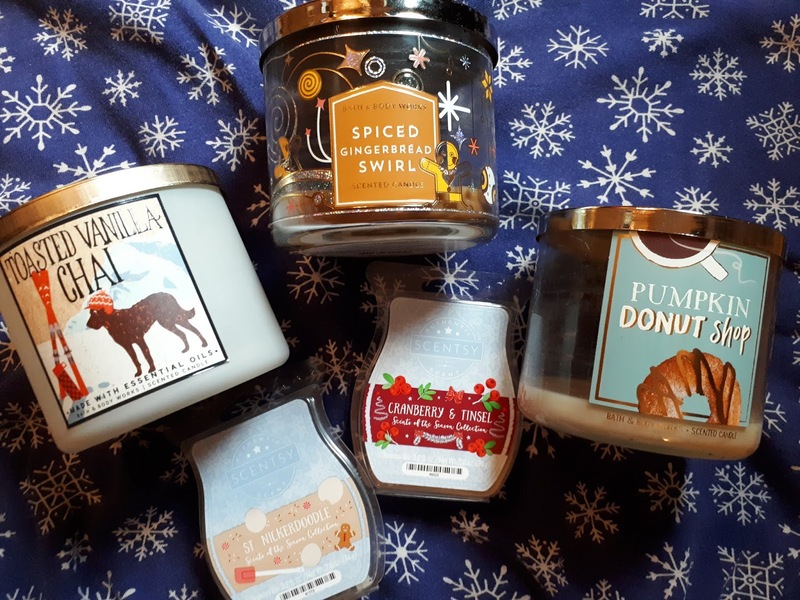 All perfect for winter/fall, and cozy scents. I already have a few backups of other scents that I prefer more, so I won't be repurchasing these. 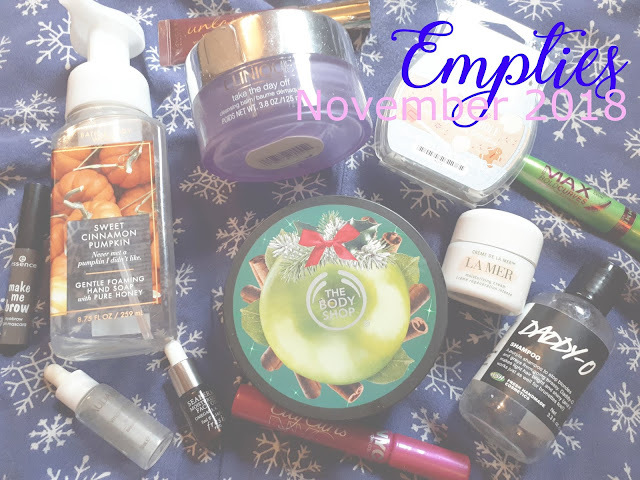 So for November, I only used up 21 products. Not nearly as much as the 30 I try and aim for every month. I will have to make December really good since it's the end of the year. I really need to try and shop my stash more often instead of rushing and purchasing the newest products. That will be my goal for January!